At the beginning of the month Eden and I caught this awful, terrible flu bug that pretty much wiped us out. As a parent, it is really tough watching your kids be sick. Aside from caring for them, there isn’t much you can do. You just have to let the bug run its course. While Eden was on the mend, she made one simple request of me. I don’t know how one turns down a sweet request like that (or why you would even think about turning it down!). Eden doesn’t often make special food requests unless it involves pizza toppings…and I don’t need to be asked twice to make a cheesecake. I thought baking a cheesecake before we left the kids would be the perfect little sweet and special parting dessert. I don’t make a lot of cheesecake around here – maybe a couple a year – so this was a real treat for the whole family. Of course, after inhaling this cheesecake within two days (two days, people! It didn’t last long in this house) I heard about how I need to make MORE cheesecake. 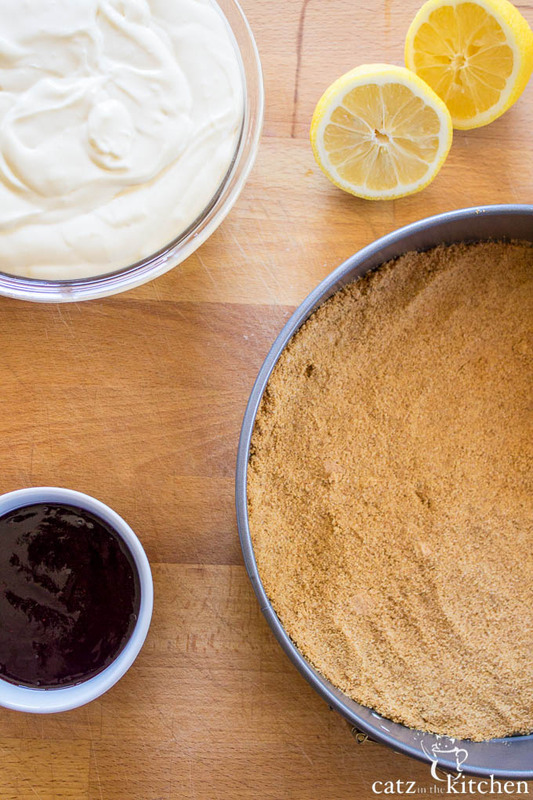 So, if you start seeing lots and lots of cheesecake on the blog, don’t blame me. Blame my family. I love to treat these guys and if they want more cowbell cheesecake, then cheesecake is what they get. 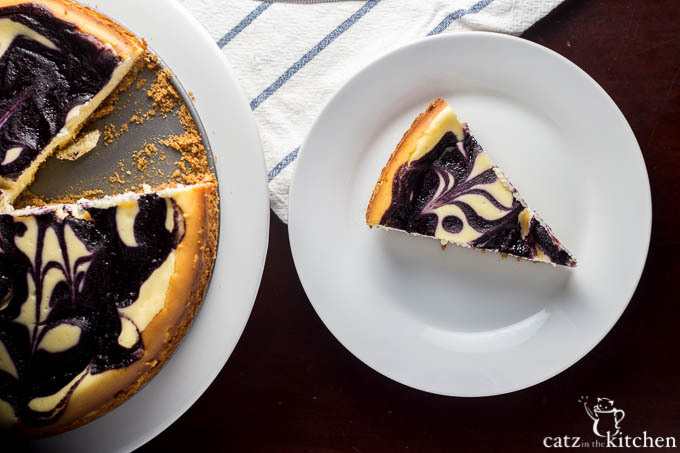 I will mention that this cheesecake is perfect for dessert on Easter. I don’t know if it’s the pretty purply-blue color (which always seems so Eastery to me) or if it is just kind of a decadent looking dessert with the swirling. But, let me tell you – this is super easy to make. It seems involved, but I promise it’s not. If I can do it, you can do it. So treat your family or your Easter Sunday guests to something a little special and kind of beautiful and show them how truly loved they are. 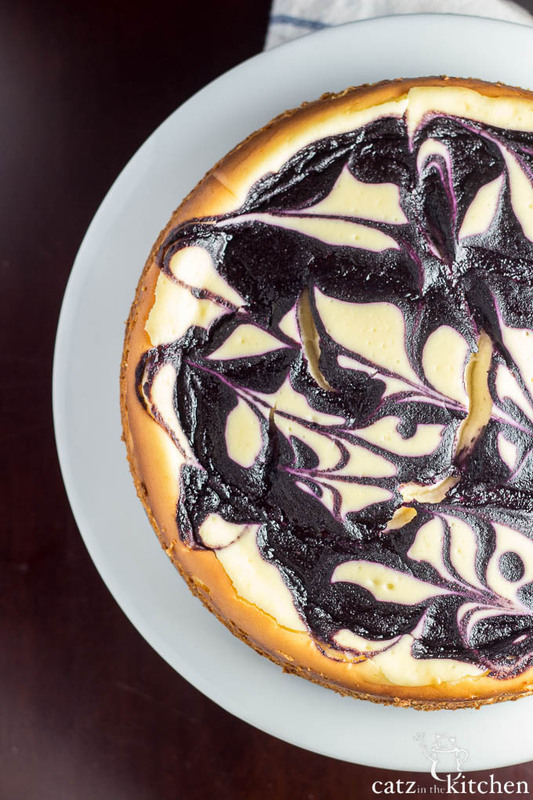 It's pretty, it's tasty, it's easy...and it's cheesecake. 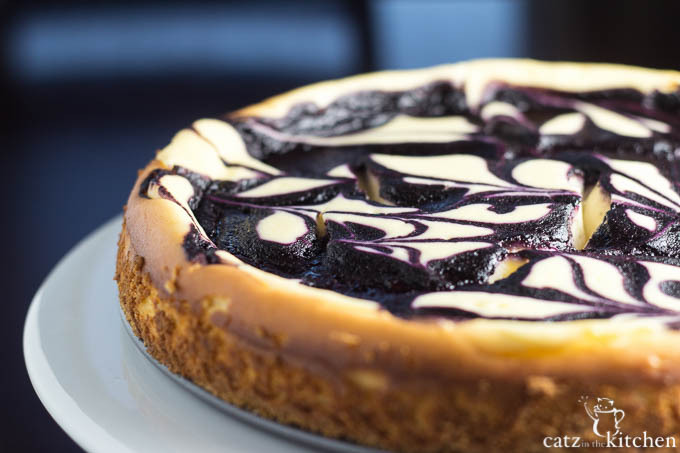 This blueberry swirl cheesecake recipe is begging you to make it...won't you? In as small saucepan, combine the blueberries, sugar, and lemon juice. Cook and stir over medium heat for 5 minutes or until the berries are softened. Combine the cornstarch and water in a separate bowl until smooth and stir into the blueberry mixture. Bring to a boil and stir for 2 minutes or until thickened. Remove from the heat and allow to cool and come to room temperature. Transfer to a blender, cover and blend until smooth. Set aside. For the crust, in a small bowl combine the crumbs and sugar, stir in the butter. Press into the bottom of a greased 9-inch springform pan . Place pan on a baking sheet. Bake at 350 degrees for 10 minutes. Cool on a wire rack. In a bowl of your stand mixer, beat cream cheese and sugar with the paddle attachment. Beat in the sour cream, flour, and vanilla. Add eggs; beat on low speed just until combined. Pour filling over the crust. Drizzle with blueberry mixture, and cut the blueberry sauce with a knife to swirl, working in a figure eight motion. Return pan to baking sheet. Bake at 350 degrees for 1 hour or until center is set. Its normal for the batter to jiggle slightly, but will firm once it comes out of the oven. Cool on a wire rack for 10 minutes. Carefully run a knife around the edge of the pan to loosen; cool for 1 hour longer. Refrigerate overnight. Refrigerate leftovers. Mmm, blueberry would definitely be my preference. Love those gorgeous swirls on top. 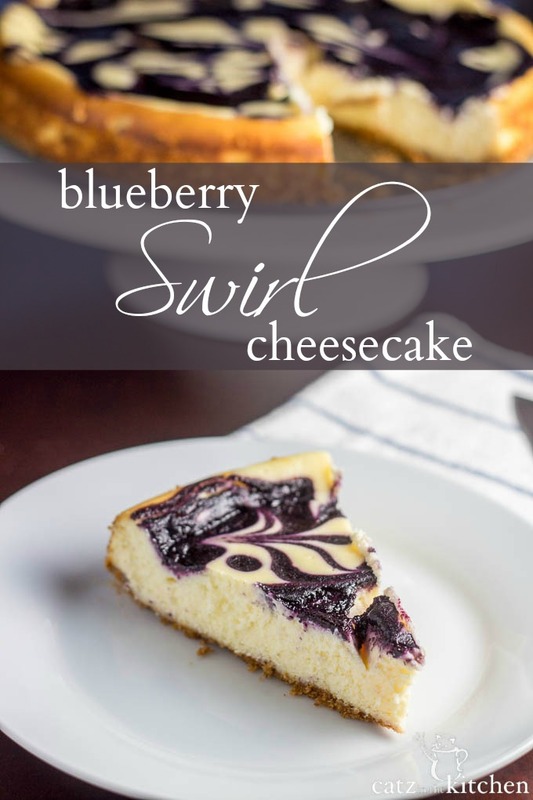 Jenn, this is a really easy Cheesecake to make and I've been making them since Josh and I got married! Travis would really like this. My mom made this the other day but instead of blueberries, she used Huckleberries and said it was excellent. You should try it! 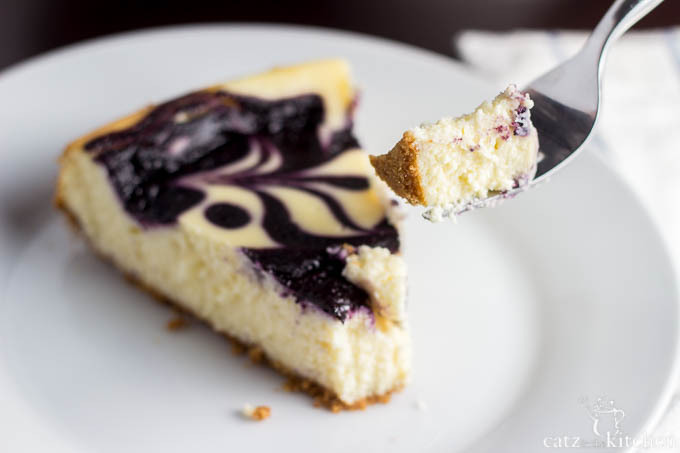 That looks amazing...I love cheesecake! I must try this! 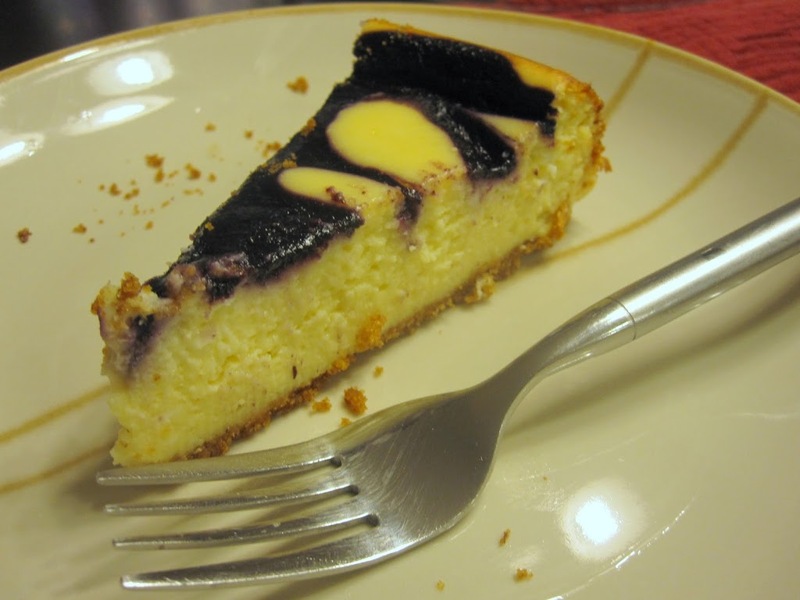 For many years Blueberry Cheesecake was my absolute favorite dessert. I still love it, but haven't had some in a while. It might be time. I LOVE cheesecake. I've never tried to make one from scratch, I really need to find an excuse to make this! Thank you for the Compliment Lizzy. 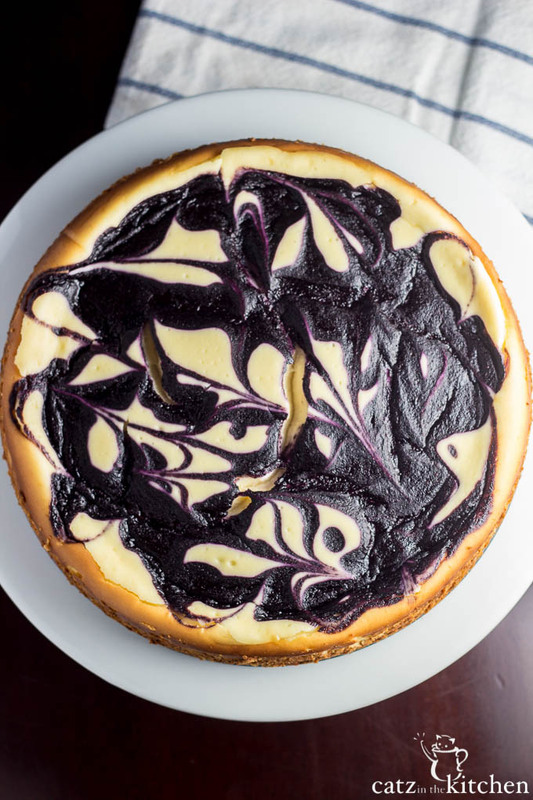 When I first was learning how to swirl in cheesecakes, I was awful, it's gotten better over the years.